Richard Melville Hall (born September 11, 1965), known by his stage name Moby, is an American singer-songwriter, musician, DJ and photographer. He is well known for his electronic music, vegan lifestyle, and support of animal rights. Moby has sold over 20 million albums worldwide. AllMusic considers him "one of the most important dance music figures of the early '90s, helping bring the music to a mainstream audience both in the UK and in America". His next major release, 2005's mostly upbeat Hotel was a stylistic departure, incorporating more alternative rock elements than previous albums, and received mixed reviews. It sold around 2 million copies worldwide. After 2008's dance-influenced Last Night (2008), he returned to the downtempo electronica of Play and 18 with 2009's mostly-ambient Wait for Me, finding higher critical acclaim and moderate sales, as well as 2011'sDestroyed. Moby's latest album, Innocents, was released on October 1, 2013. 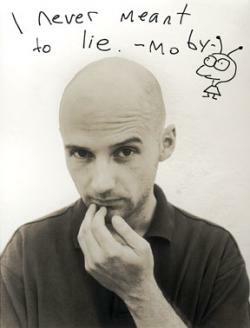 Moby has also co-written, produced, and remixed music for Michael Jackson, David Bowie, Daft Punk, Myl�ne Farmer, Brian Eno, Pet Shop Boys, Britney Spears, New Order, Public Enemy, Guns N' Roses, Metallica,Soundgarden, and others.